Extreame Savings Item! Free Shipping Included! Save 50% on the BESTILL Sinktop Air Switch for Garbage Disposal,Brushed Nickel by BESTILL at Humble Opinion. MPN: BT40A40PBN. Hurry! Limited time offer. Offer valid only while supplies last. Color:Brushed Nickel BESTILL Garbage Disposal Air Switch Kit with Single Outlet Adapter Available in 5 finishes. Work with any Garbage Disposal Unit. Work with any Garbage Disposal Unit. --- The Air Switch Kit adds an elegant touch to the kitchen.BESTILL offers a variety of styles and finishes to enhance the overall appearance on your Sink and Faucet at an affordable price. The Cover of Air Switch Button for Food Waste Disposer is durable Brass Constructed,with Brushed Nickel Finished.Also available in 4 colors:Oil Rubbed Bronze,Brushed Gold,Polished Chrome,Matte Black. --- Compared to the traditional wall switch,Air Switch Unit is a trend and safe choice by Island installation.The Power Module uses a flat Single Outlet Adapter and is compatible with any garbage disposal power cord,as well as dishwasher.Moreover, it is easy and convenient for you to mount to the wall and plug into the socket.In addition,the power cord is thick enough to handle a larger current and is less prone to heat. ---BESTILL Garbage Disposal Air Switch Kit is compliant with United States standards and fits any brand or model of food waste disposers,perfectly well for Insinkerator,Waste King,Moen,GE and so on. 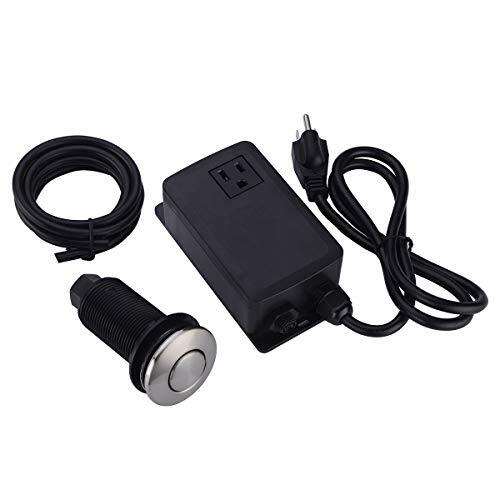 ---Air Switch Kit can be mounted easily to any Countertop or Sinktop ,and you can mount the push button through the Countertop by drilling a 1-3/8 inch diameter hole.Moreover,the 3 inch extended body allows you to install on thicker Countertop with ease(but thinner than 2-1/5 inch). Connecting Air Pressure Switch Button and Power Module via Air Hose and pushing the air hose tightly onto the molded protrusions. --- Air Switch Kit mainly contains 1x Single Outlet Power Module,1x 3-1/3 feet Power Cord,1x 3-1/3 feet Air flexible pipe,1x Air Switch Button(you can choose any finish) and several Set Screws. GOOD DESIGN-The Cover of Air Activated Switch Button for Food Waste Disposer is Brass Constructed,with Brushed Nickel Finished.Also available in 4 colors:Oil Rubbed Bronze,Brushed Gold,Polished Chrome,Matte Black,Champagne Bronze. HIGH SAFETY-Compared to the traditional wall switch,Air Switch Unit is a trend and safe choice by Island installation. HIGH APPLICABILITY-US standards,Air Switch Kit works with any brand of Garbage Disposals,perfectly well for Insinkerator,Waste King,Moen,GE and so on. EASY TO INSTALL- Air Switch Kit can be mounted easily to any Counter Top or Sink Top,and you can mount the push button through the Countertop by drilling a 1-3/8-Inch diameter hole.Moreover,the 3-Inch extended body allows you to install on thicker Countertop with ease(but thinner than 2-1/5-Inch).